Some people thrive on stress, others don't. Coaches at LifeConnect will provide you with practical strategies for preventing corporate burnout and regaining work-life balance. 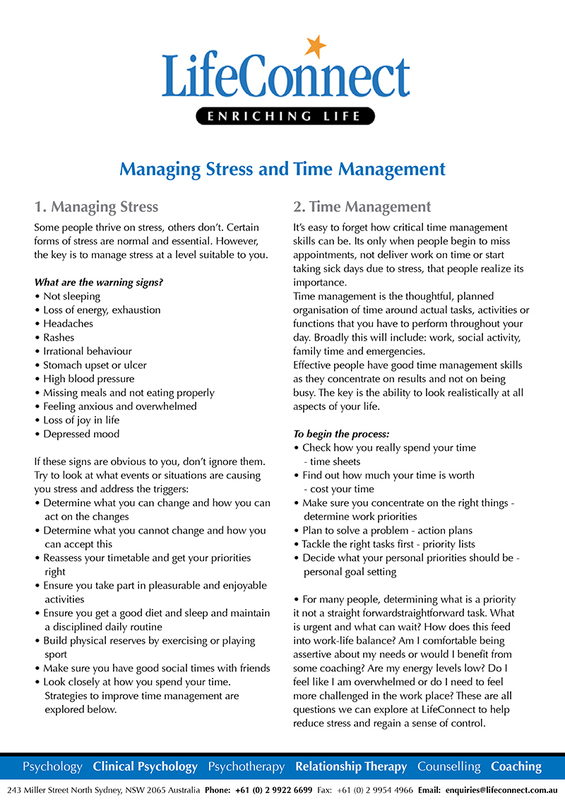 Download Signs of high levels of stress and tips for managing anxiety in the workplace. Differing viewpoints often arise in small businesses and it is imperative to address any concerns immediately as they are likely to escalate and become more difficult to navigate. Once a conflict escalates beyond a certain level, a professional mediator who is impartial and not associated with the dispute, may be required. LifeConnect can provide mediation or counselling to effected parties before it escalates. Download A workplace dispute typically moves through three stages. LifeConnect Director and Clinical Psychologist, David Baldwin explains why having a sense of purpose is critical to achieving work-life balance. Drawing on the experiences of the director of a large engineering company he describes how they worked together in therapy to regain control of his life. The exercises outlined allowed for more creative thinking and inspiration as well as a decline in anxiety. 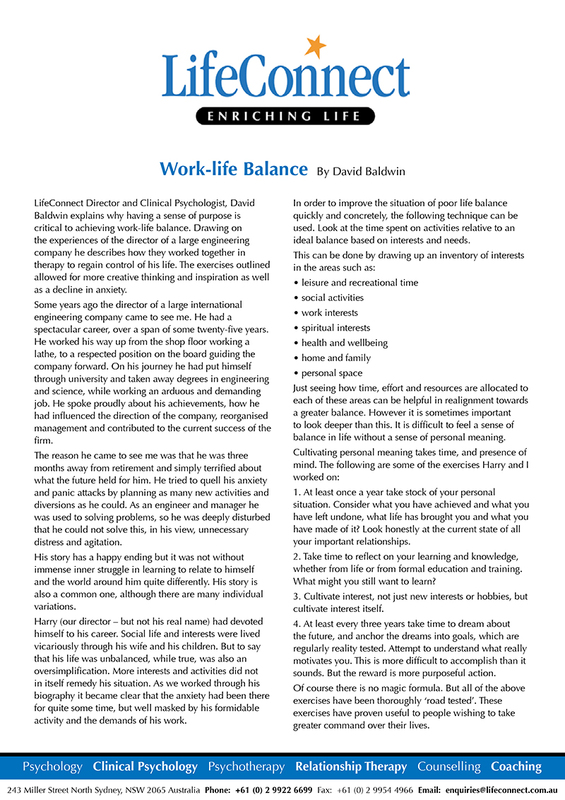 Download Work-Life Balance by David Baldwin. Parenting skills are constantly evolving with the relationship between the caregiver and their developing child in endless transition. There are no set rules, but the philosophy of mindful parenting leaves us open to the process of change, accepting of uniqueness and able to reassure our children that they are loved in each moment. The experience of grieving is a unique process for each person. At LifeConnect the psychotherapist or psychologist will help you find a balance between giving the sadness space and replenishing your inner self to allow for new life. Psychotherapist, Cheryl Assuage, explains that most people need to learn how to grieve and benefit from support that emphasizes nurturing ourselves. Download Coping with Grief by Cheryl Assuage. There is widespread agreement that the journey of human life can be chartered as moving through several phases of personal growth. Despite our differences, we will experience each milestone in a similar way and how we progress through each stage will be critical for our happiness and development. Much psychological suffering stems from being trapped in one phase or failing to have our needs met or validated at an earlier time. LifeConnect Director and Psychotherapist, Cheryl Assuage provides a brief outline of these phases. Download The Developmental Phases of Life by Cheryl Assuage.